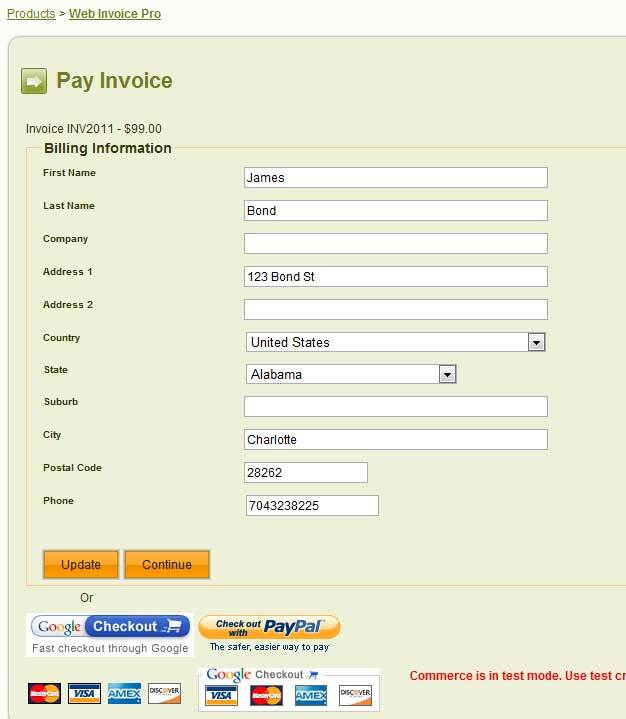 Web Invoice Pro makes it easy to send invoices by email and let your customers pay the invoice online at your web site running on mojoPortal. It provides support for receiving payments via Authorize.NET, WorldPay, PlugNPay, PayPal, and Google Checkout. 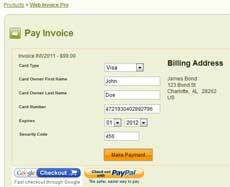 A great way for freelance web designers and developers or any business to invoice their customers. You can test Web Invoice Pro on demo.mojoportal.com, so you can try it before you buy it, though of course you should only send test invoices to yourself from the demo site and the demo email messagess will have extra text in them to make it clear it came from a demo site. 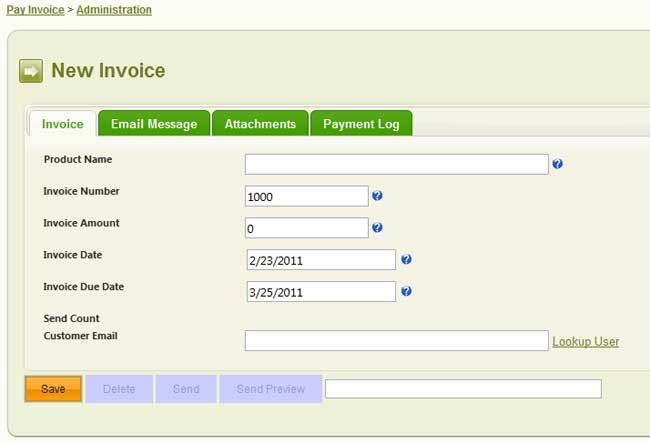 Attach a PDF Invoice generated from your accounting system and/or just type in the invoice information as part of the email message. 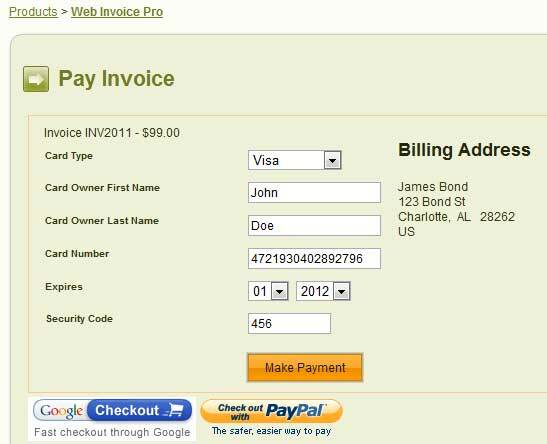 Customers can pay the invoice online at your web site using Authorize.NET, WorldPay PayPal, and Google Checkout. Customers do not need to be registered on your site to pay the invoice, but if they are then they can see their payment history in the user profile. 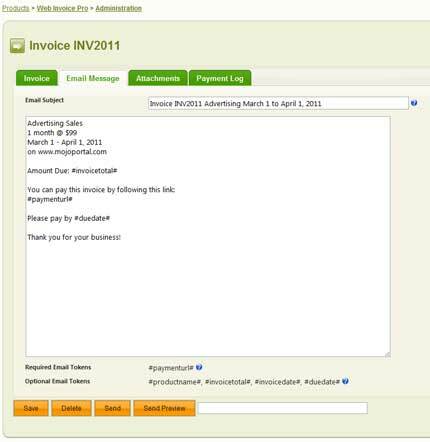 Optional email notification when invoices are paid. 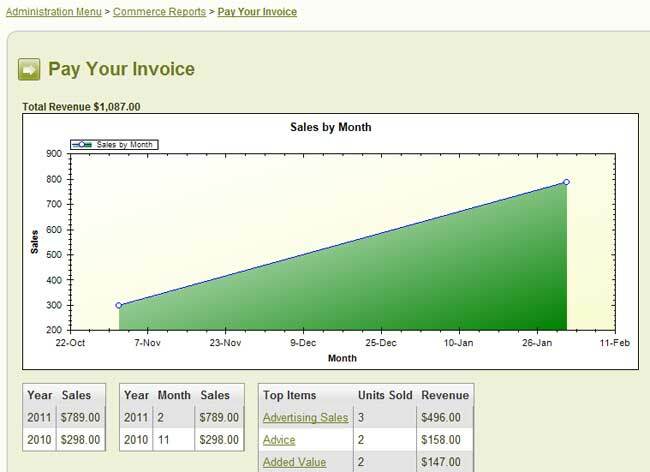 Integrated with the mojoPortal Commerce Reports system so you get reporting and charts of your invoice revenue. Get Web Invoice Pro and get paid! Note that while the screen shot below shows that it is possible to lookup an unpaid invoice, the email includes a direct link to where the user can pay the invoice, so the customer never really needs to look it up if he clicks the link in the email. Also if the user was authenticated it would show any open invoices right on the page with links to pay. So there is a lookup feature and it works but generally is not needed. You can specify an Email From address or if left blank it will use the site default email from address. 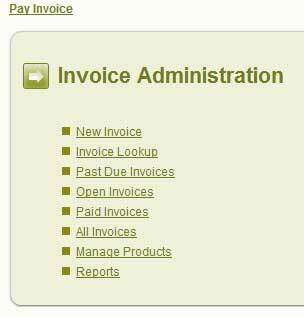 You can also get notification when invoices are paid. Invoice numbers can be generated for you using a seed number and an optional prefix, but you can override it for any given invoice. Note that in the screen shot below Authorize.NET is enabled so the customer would enter billing information if they checkout directly on your site using Authorize.NET. If only using PayPal and/orGoogle Checkout, it will not show this form, it will only show the Invoice Number, amount and the checkout buttons for PayPal and/or Google Checkout. Below is a screen shot of what it looks like when paying directly on your site with Authorize.NET. Commerce Reports is a built in feature of mojoPortal, and Web Invoice Pro pushes data into the reporting system when payments are received. First, you need a web site running the free open-source mojoPortal software (version 2.4.0.9 or higher hosted with ASP.NET 4.5 or higher) using MS SQL 2005/2008/SqlAzure or MySql for the database (We may consider supporting other databases in the future). You should get your site working before you buy the Web Invoice Pro Feature. For information on setting up a mojoPortal site, see mojoPortal Installation. If you need an older version please contact us. After purchasing Web Invoice Pro, download the .zip file to your local machine and using an FTP Client like FileZilla, copy the contents of the wwwroot folder into the root folder of your mojoPortal web site. Then visit http://yoursiteroot/Setup/Default.aspx to complete the installation of Event Calendar Pro. See also the InstallationInstructions.txt file included in the download. 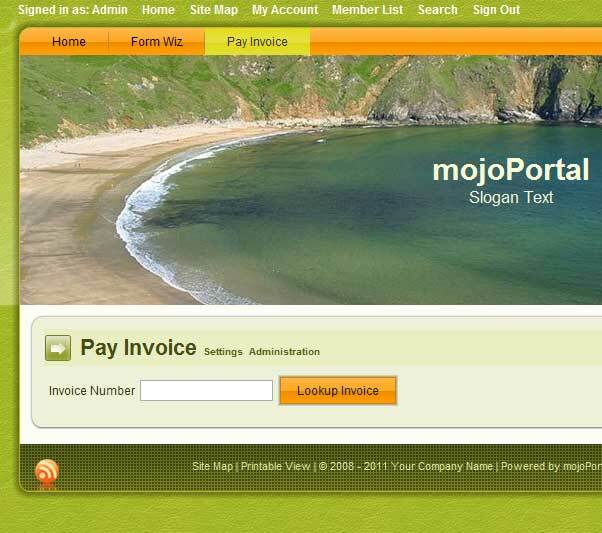 0.0.0.7 Released 20110-03-30 - compatibility update for mojoPortal 2.3.6.4, also adds the ability to cancel an invoice. 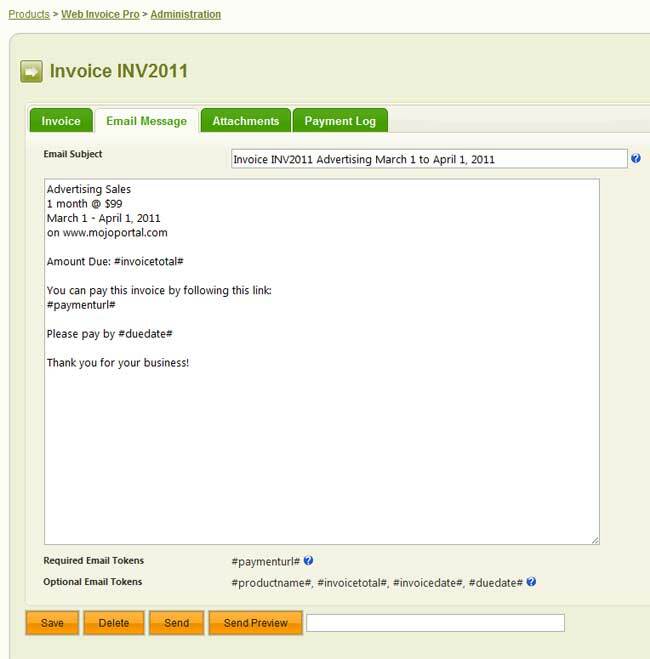 1.7.0.1 Released 2011-06-21 - added ability to mark an invoice as paid if payment comes in from a different channel rather than online. Fixed a bug where invoice due date was always forced to 30 days after invoice date even if specified directly. Compatibility updates for mojoPortal 2.3.6.6. 1.7.0.4 Released 2012-05-14 fixed a bug where cancelled invoices showed up under open and unpaid invoices. 1.7.0.7 Released 2012-11-26 fixed bug where WorldPay did not work unless the user was authenticated. Requires mojoPortal 2.3.9.4 or higher. 1.8.0.0 Released 2018-10-20 compatibility update for mojoPortal 2.7, MySQL 8 Support, read more in the mojoPortal 2.7 release announcement.